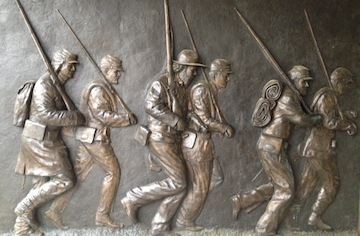 A bas-relief sculpture outside the Cornith Civil War Interpretive Center depicts the bedraggled Confederate withdrawal into the city after Shiloh. “What is it you like about Corinth?” I ask Dan. We’re stopping at the little Mississippi town in the northeast corner of the state so Dan can get some pictures. He’s been at work on an ECWS book about Corinth—the siege in the spring of 1862 and the battle the following fall. “I’ve read a lot about it, but I’ve never been there,” he’d told me as we were planning the trip. Today’s stop is built into the trip just for him. That makes a whole lot of sense to me, especially for the fall battle, although I’d never put Corinth into that context. Braxton Bragg makes his stab into Kentucky and Robert E. Lee his stab into Maryland as part of a multi-pronged Confederate offensive all across the map. It would stand to reason Confederates would try to do something along the Mississippi. Bragg, commanding the Confederate Army of Tennessee, directed Sterling Price to move into western Tennessee to put pressure on Nashville, which would alleviate pressure on Bragg’s left flank as he moved from central Tennessee northward into Kentucky. Confederate general Earl Van Dorn wanted to join forces with Price and take part in the push. 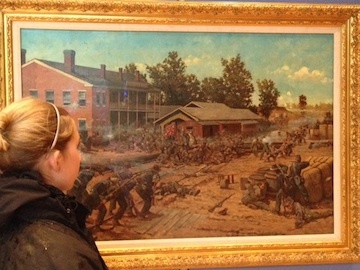 Steph checks out a painting of the fall battle of Corinth, on display at the Corinth Civil War Interpretive Center. In order to get to west Tennessee, though, they first have to go through the Federal garrison at Corinth. Capturing it would secure their rear while also giving them a supply line. “It would basically be Grant’s spring campaign but in reverse,” Dan says. Of course, Lee fights at Antietam to a draw, Bragg wins at Perryville and nonetheless withdraws—and those two actions have garnered all the attention ever since. Van Dorn’s effort at Corinth is basically a non-starter, scoring some success on the first day of battle that he then loses on the second day. “One of his division commanders gets ‘sick,’ and the other never even attacks, so the assaults on the second day go poorly,” Dan explains. “There would have been no Shiloh if not for Corinth,” Dan says. “That’s what draws the Federals down the Tennessee.” And the Federal presence is what draws Confederates out of Corinth into battle at Shiloh. After the Confederate defeat, they fell back to Corinth, and the Federals snailed after them, eventually besieging the town. Confederates withdrew at the end of May, 1862. 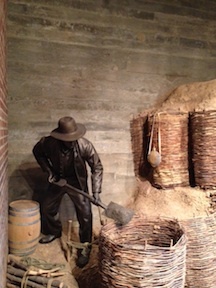 Federals occupied the town through the summer, prompting Van Dorn’s fall attack. Van Dorn’s failure to capture Corinth, in turn, gives Grant the platform he needs to move down the Mississippi in his conquest of Vicksburg. This entry was posted in Battlefields & Historic Places, Campaigns, Emerging Civil War Series and tagged Antietam, Braxton Bragg, Civil War Trip 2015, Corinth, Earl Van Dorn, Emerging Civil War Series, Perryville, Sterling Price, Vicksburg. Bookmark the permalink. Great commentary on the fall 1862 battle’s importance. It was also the battle that catapulted Rosecrans to army command at the end of October 1862. Yes! And that is one of the microcosms of Corinth that is so interesting. Through the course of 1862, Halleck, Pope, Rosecrans and to a lesser degree Grant-by Halleck’s promotion-are elevated because of their actions during the Corinth operations. I find it interesting that in that piece, Rosecrans wasn’t mentioned once. Van Dorn got a couple of nods, Bragg, Grant, etc. Rosecrans actually won the battle, seems like he would get some pub. In all fairness to Dan, he did tell me that Corinth was the battle that set the stage for Rosecrans’ ascension to command of the Army of the Cumberland. I should have added a mention of that at the end when I talked about Corinth as a platform for Grant’s move south.